The Brisant Ultion has finally achieved TS007 3 star and sold secure diamond standard. As far as I’m aware there is only one other lock which has achieved sold secure diamond and that’s the Avocet ABS. Both the ABS and the Ultion were designed by Steve Stewart so that’s quite an achievement being the only person to ever design a lock that has got through the diamond test. 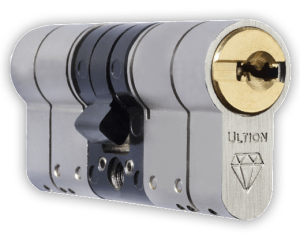 Since there’s only the Ultion and ABS that have managed to get the Sold Secure Diamond accreditation this post will be a little bit of a comparison between the two locks. I have been fortunate enough to see the Brisant Ultion quite a lot at different stages of the design process and have tested quite a lot with Steve, snapping, bumping and picking so I know quite a lot about the lock. Although I know Steve this is a completely impartial review based on what I’ve and learned as I’ve seen the lock being developed. When I first ever met Steve he told me about his plans to make “locks for locksmiths” and make Brisants full range of locks locksmith friendly. The aim was to make good quality locks that were easier for local locksmiths to stock and pin up themselves. They seem to have definitely achieved this but the only thing missing was a top of the range cylinder 3 star cylinder, until now! So that’s four locks in total just to cover that one size, with Ultion you would only need one lock. It seems like a no brainer to me. The Brisant Ultion manages to be non-handed because the firing pin which locks into the cam fires from underneath when the cylinder is snapped at the second pre determined weak spot which is just in front of the cam, locking the cam in place. Because the pin fires from underneath this means one can be built into each side of the cylinder meaning that no matter which way around you fit the lock there is always a firing pin ready to lock the cam on the external side of the cylinder. When you actually see it in action it’s a really clever idea and seems like one of those, why did nobody else think of that ideas? One big plus point is that when a key is left on the inside of an Ultion the cam locking mechanism still activates, when I have tested this on an ABS with a key on the inside it stops the mechanism firing meaning the cam can be turned when its not supposed to. Firing pin locks the cam from underneath when attacked. The Ultion is available in all sizes and also in modular form meaning you can make locks on the go. You can simply buy the separate halves of cylinder and put them together yourself to make any size you want. You can also break apart two full locks in an emergency and swap the halves around and then re key the locks to get the size you need if you need a particular size there and then and can’t wait for an order to be delivered. 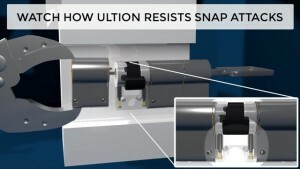 From the snapping tests I have done on this lock it performs just as good as Avocet ABS. Both have a sacrificial cut about 10mm back from the front of the lock, both have a second pre determined sacrificial section right in front of the cam. Both lock the cam once the cylinder is broken on the second sacrificial part blocking access to the gearbox. So from a snapping point of view they both offer exactly the same levels of security. Personally I will now only offer Brisant anti snap locks, I buy all my cylinders from them now as its like a one stop cylinder shop. I buy the cheap Mila bog standard cylinders from them, Brisant E as a mid range anti snap for customers who want a good anti snap lock but don’t want to pay a lot of money and I have been using Yale AS platinum 3 star from Brisant as well but now I will 100% be swapping over to Ultion as my top of the range option for customers. For Ultion locks fitted in Leeds and West Yorkshire please visit our Locksmith Leeds Page. One thing we need to hope for with Ultion is that the prices are not screwed down online like they are with some locks. Brisant has always used “locks for locksmiths” as there slogan. That’s locks for locksmiths to make money on though as well as them being locksmith friendly. Some of the top quality anti snaps are so hard to sell to customers now due to them being sold so cheaply online and sometimes cheaper than we can buy them from trade suppliers! This means we can’t make a mark up on the locks at all and when you give a customer a price including labour they run a mile claiming they can get the lock themselves at half the price! Lets hope this doesn’t happen to Ultion!